Sgt. Charles White of the Hendry County Sheriff's Office took the photo, which was posted to Facebook on May 13. "Gator caught stealing watermelon out of watermelon field in Hendry County,'' a Florida Agricultural Crimes Intelligence Unit officer wrote May 13 on the group's Facebook page. Sgt. Charles White of the Hendry County Sheriff's Office took the photo. 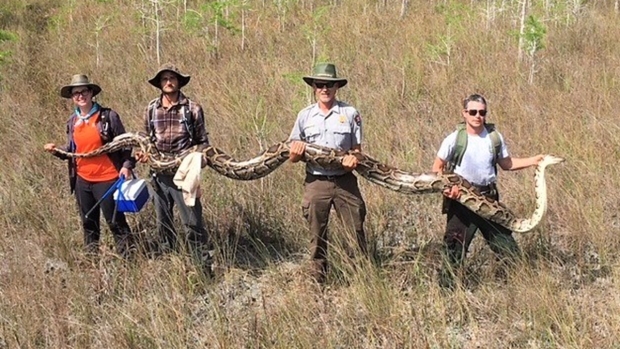 The photo stunned Steve Stiegler, a wildlife biologist in the alligator management program at the state's Fish and Wildlife Conservation Commission. "Um," he said, chuckling. "This would be unusual. Watermelons are not generally part of an alligator's diet." Alligators are predatory carnivores that eat fish and frogs when they're small. "As an alligator gets larger, it will eat larger fish, larger vertebrates such as snakes, birds, land mammals that get too close to the water or attempt to swim across the body of water," Stiegler said. That's a no-no, Stiegler said. "That alligator probably has a sweet tooth, and one of the more popular treats for people who illegally feed alligators are marshmallows. Alligators can taste sweet, and somehow this alligator got a taste of a watermelon and he's gone back for more." For more "Only in Florida" stories, click here.